Though Hong Kong is one heck of a city, not everyone wants to live in the hustle and bustle of it all. 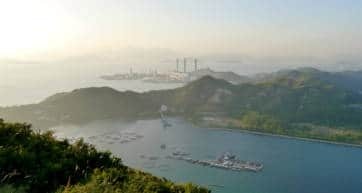 In fact, many Hong Kong residents live on the Outlying Islands and commute by a very scenic ferry ride to Central. Lamma is one of those islands, having been an escape from city life for decades. This so called ‘hippie haven’ of Hong Kong has a laid-back island vibe, no cars (bicycles only), cute cafes, and beautiful nature to explore. On weekends Lamma can get very crowded with day trippers, so if possible go on a weekday when the ferries aren’t so full. You catch the ferry from Central Pier #4, but be aware there are two different piers on Lamma—Sok Kwu Wan in the south, and Yung Shue Wan in the north. You can take the ferry back to Central from either of these villages, but the ferry from Yung Shue Wan is more frequent. Yung Shue Wan is the biggest village on Lamma, with a scenic bay and a traditional fishing district. The waterfront has a cluster of famous seafood restaurants, but wander around Main Street and you’ll find quaint shops, trendy cafes, souvenirs, second-hand books, and tiny bars frequented by the resident expats. Sok Kwu Wan, on the other hand, is smaller and quieter, with just a few hundred residents and a lively harbour full of fishing boats. The Lamma Fisherfolk’s Village is a large open-air museum built on the water showcasing the traditional fishing culture of Hong Kong. You can explore a real wooden junk boat, and see what life was like inside the floating homes of fisherfolk communities. If you enjoy hiking, take the ferry from Central to Sok Kwu Wan in the south, and follow the Lamma Family Trail over to Yung Shue Wan in the north. On this easy 5km stroll you’ll pass the pretty Picnic Bay, Tin Hau Temple, and the Kamikaze Cave used by the Japanese during World War II. From the Hilltop Pavilion, you’ll get great views of Lantau and Cheung Chau islands. When you reach Yung Shue Wan, walk around Main Street, and enjoy a meal at one of the many seafood restaurants before taking the ferry back to Central. Lamma has a number of lovely beaches, but the most popular is Power Station Beach, about a 15-minute walk from Yung Shue Wan Pier and next to the Hong Kong Electric Power Plant. If you’d rather not swim right next to three giant chimneys, go a bit farther to Hung Shing Ye Beach. On the other side of the island, accessible from Sok Kwu Wan, is Lo So Shing Beach, though the southern part of the island has many untouched bays to explore. Mo Tat Wan is about a 20-minute walk, but well worth it to get the beach all to yourself. To get out in the water, take a guided trip with Sea Kayak Hong Kong to the small deserted Dog Island, just off the coast of Lamma. Lamma is famous for seafood, with the massive 800-seat Lamma Rainbow in Sok Kwu Wan being the biggest and most well-known—they even have their own ferry. 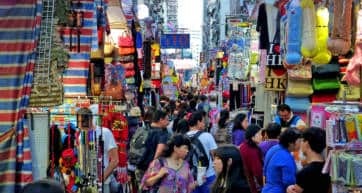 It’s good, but if you want to skip the tourist trap (and the tourist prices), go instead to nearby Wai Kee Seafood Restaurant, or Tai Yuen, both along the waterfront. Over on Yung Shue Wan, you have a wide variety of choices. Andy’s Seafood Sau Kee Restaurant on Main Street has a great ocean view and is a long-time favourite with islanders. The Island Bar is Lamma’s oldest watering hole, and right by the Yung Shue Wan ferry pier so you can grab a pint before returning to Central. The British-style Blue Goose Tavern serves all-day breakfast, while Lamma Grill has proper American grub and pizza. If you fancy a bit of spice, try the Indian dishes at The Waterfront Restaurant, which, as the name implies, has gorgeous sea views. Vegetarians are in luck on Lamma (remember what we said about ‘hippie haven’? ), with the cosy Bookworm Cafe, Green Cottage and LaLa Mama’s all serving organic veggie and vegan dishes. Craft beer is becoming increasingly hip in Hong Kong, and Lamma has its own homemade brew, made by the Yardley Brothers. You can get their tasty IPA on tap at a number of Lamma pubs and restaurants. With a prime spot at the ferry pier, Man Lai Wah Hotel is a great location to stay with easy access to everything—and without dragging a suitcase for 20 minutes. Also nearby is Bali Holiday Resort, which has the option to book a room with a kitchenette. If you actually don’t mind dragging a suitcase a bit, then you can holiday at Hung Shing Ye Beach. The Concerto Inn has been welcoming guests for almost three decades and has a prime beach front location with a lovely cafe and bar. The Bayshore Inn also overlooks the beach, so be sure to get a room with a balcony to enjoy the salty sea air. There are many Airbnbs to choose from around Yung Shue Wan, but to really escape from civilization, stay on the other side at one in Sok Kwu Wan. Accommodations are available in three-storey village houses, where you can rent anything from a shared room to the entire house, which would be suitable for groups. For a really unique experience, you can camp for the night on the beach— through Airbnb—with all camping gear provided, near to the public facilities.